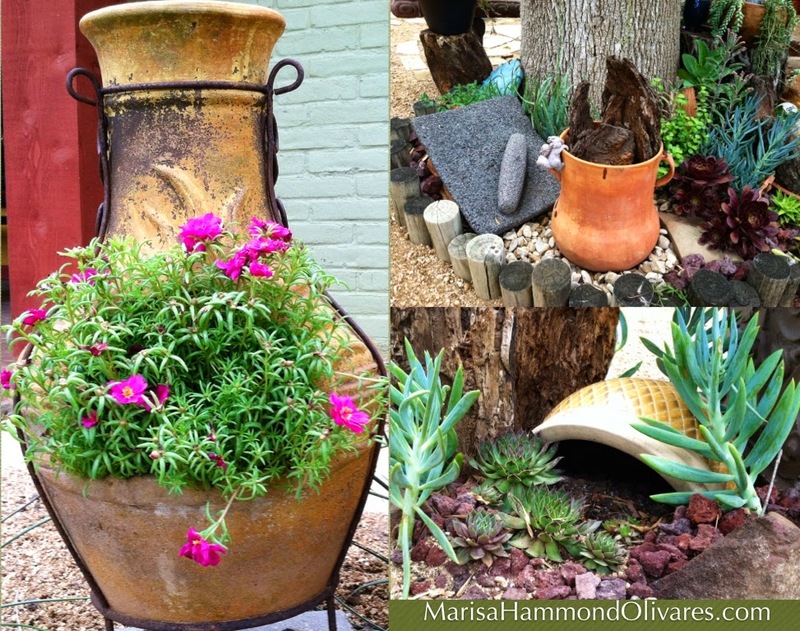 Unique pottery pieces can be used to enhance container gardens and flower beds. Gladiolus, ixora, portulaca, cordyline and sweet potato vine add color and interest. Not all succulents tolerate direct sun. 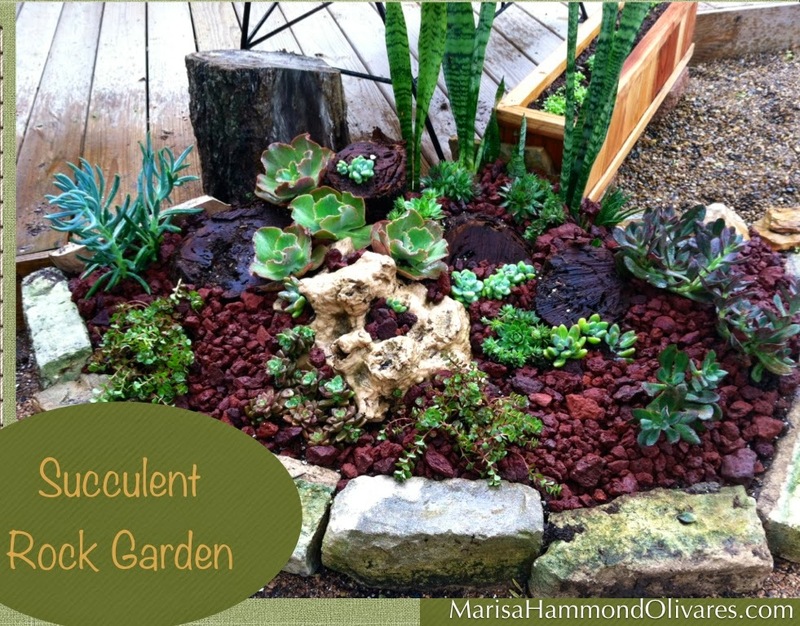 Be sure to research the various types of succulents and plant them accordingly. This particular rock garden gets very little direct sun. 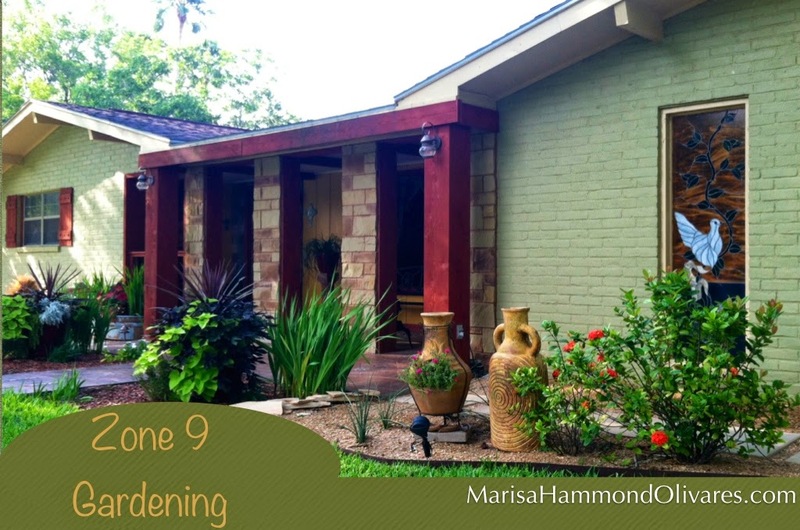 Decomposed granite helps keep water bills down and lets you focus on watering your flower beds. 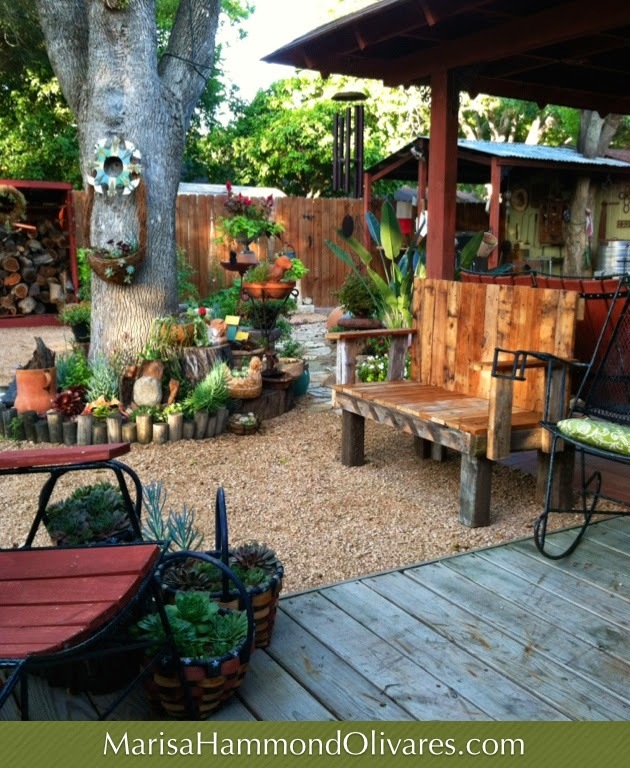 Keep your yard colorful and fresh with a variety of pottery and yard art. My husband is very proud of his garden bench, he made it with pallets and reclaimed wood. 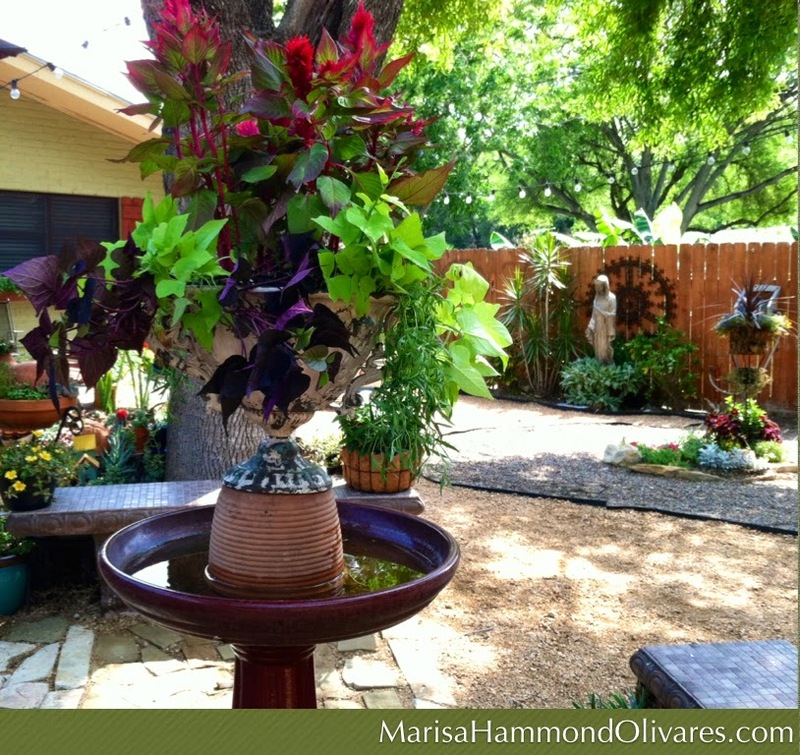 An urn elevated in a bird bath helps shade the water in our scorching south Texas sun. Celosia and sweet potato vines add contrast and color. Bougainvillea is a common flower in our area and require little maintenance. Be sure to prune as needed or it can easily grow into an evil monster. 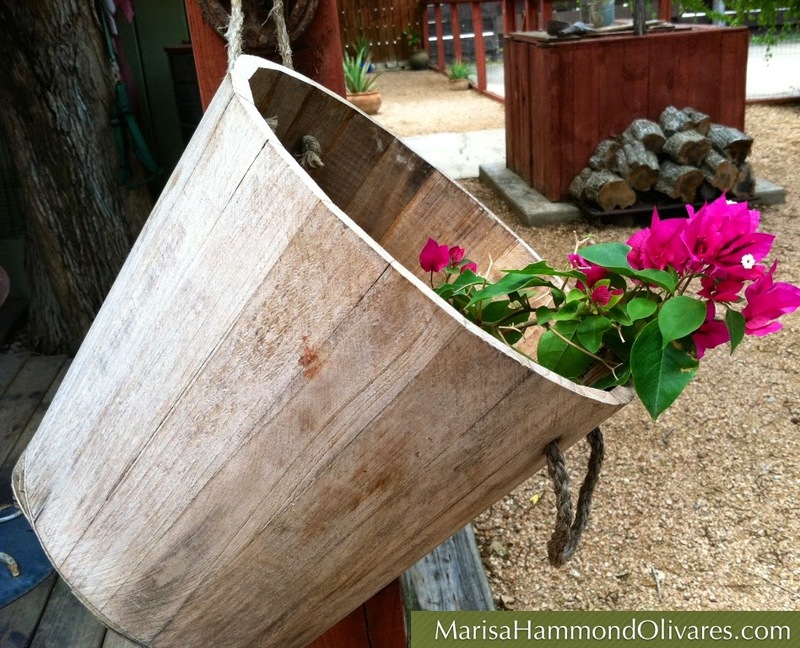 This one looks cute peeking out of a hanging wooden bucket. 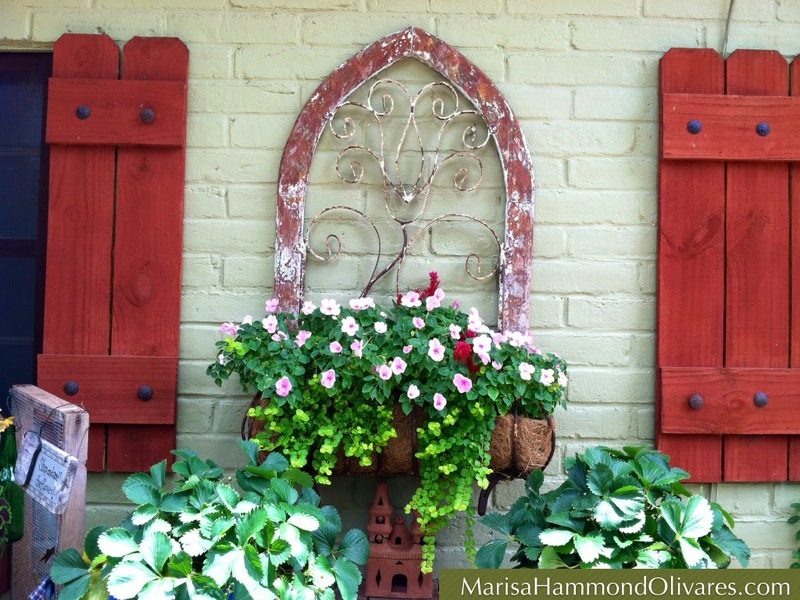 Keep window boxes and containers interesting with a variety of color. This wall gets partial shade, a great place for impatients, celosia and creeping jenny. The strawberry plants in front produced quite a bit of fruit this season. 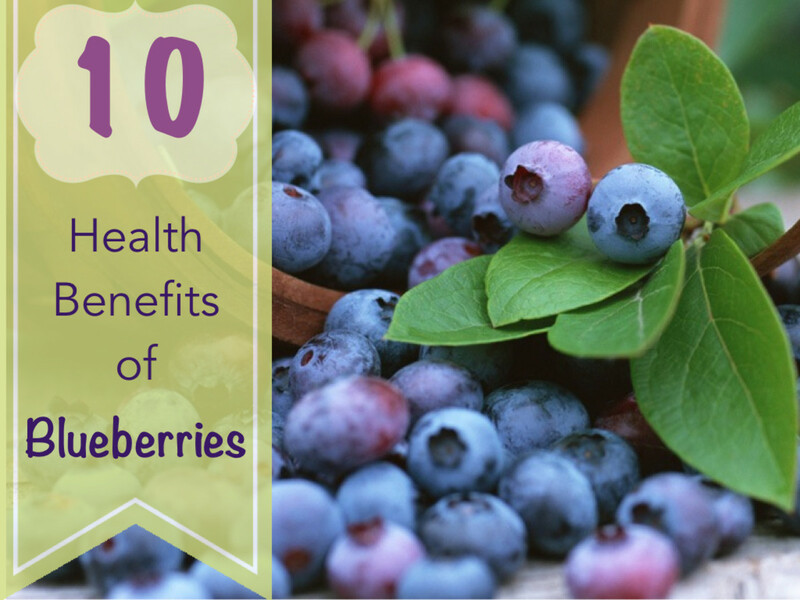 They need to be watered regularly though. You can find me drinking my morning coffee next to this little vignette. The vintage milk can makes a great stand for my pythos, coleus and impatient basket. I also keep calla lilies, creeping jenny and a variety of succulents in this are. This area gets morning sun and indirect sunlight during the day. 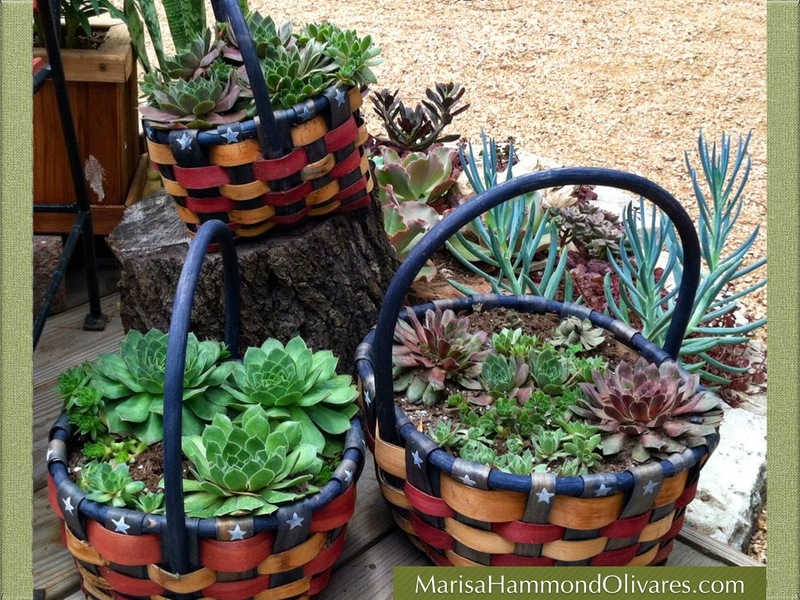 Succulents are pretty low maintenance and can be planted in a variety of containers. I keep plenty of logs around to prop my flower pots and containers. 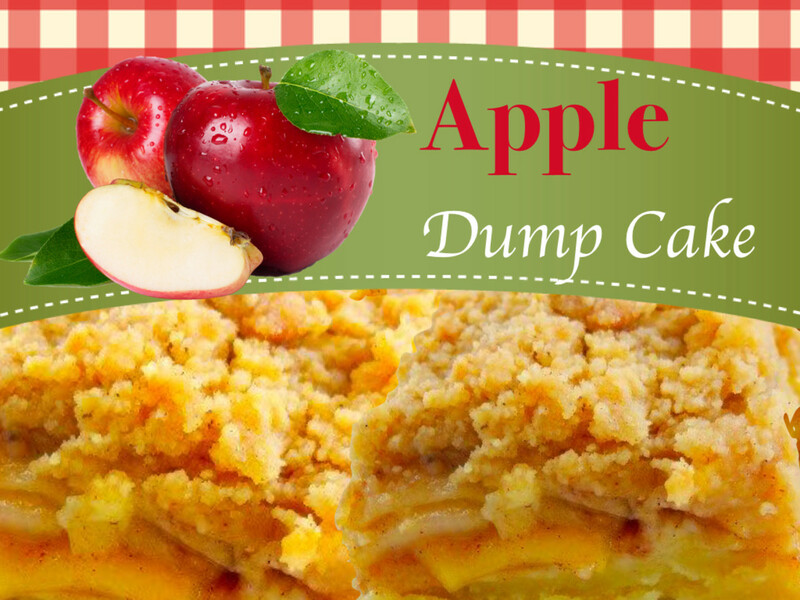 I like to keep things rustic and natural. 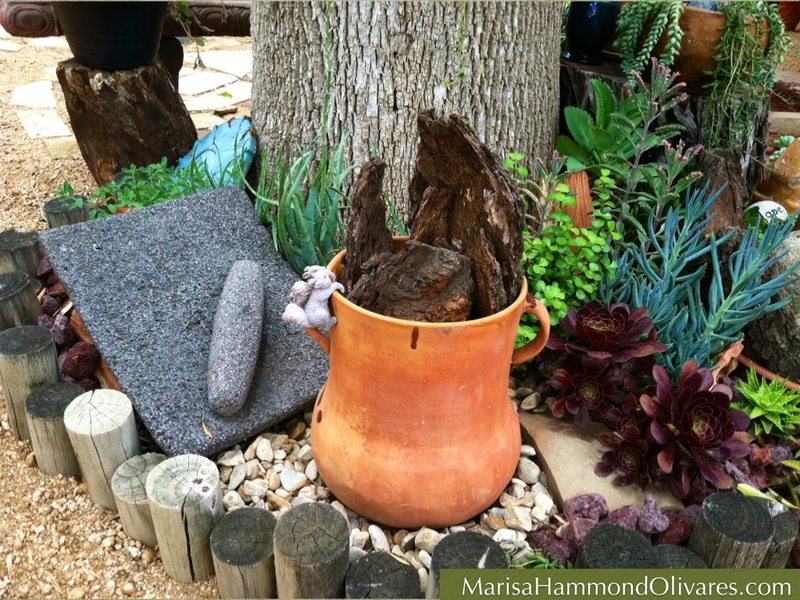 I added a few memorable accessories to one of my succulent rock gardens. Mom brought these with her from Mexico and they hold many childhood memories for her. They add a sentimental touch and provide great color against the variety of hues found in succulents. 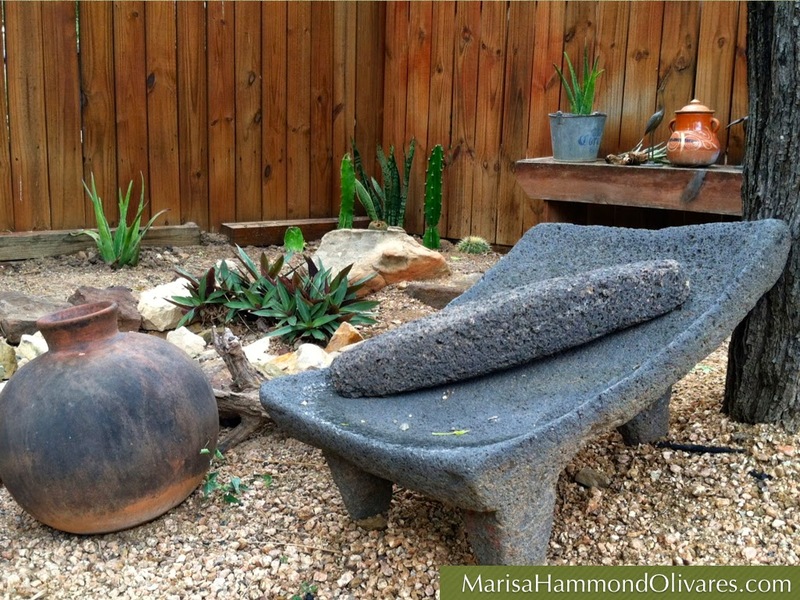 Decomposed granite and rustic accessories help create a relaxing south Texas theme in this dry creek bed. 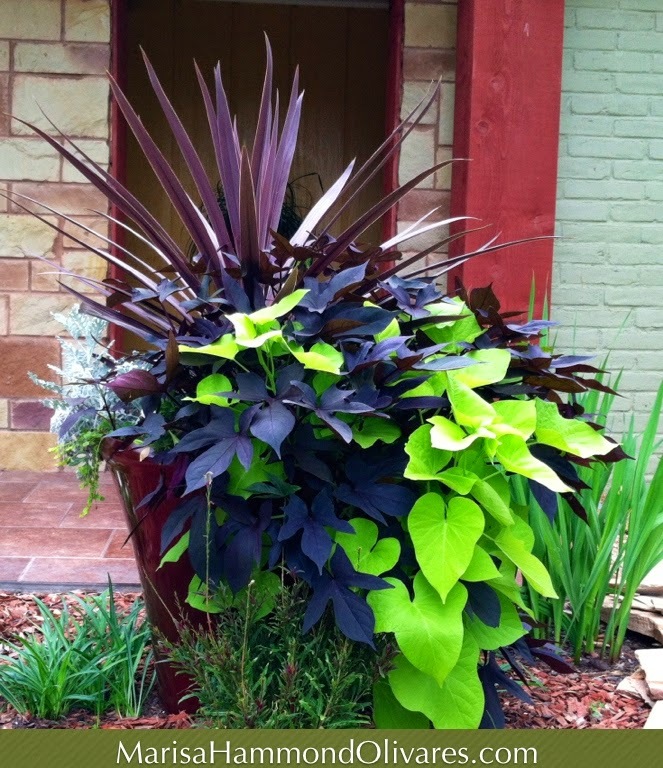 You can't go wrong with cordyline and sweet potato vines. 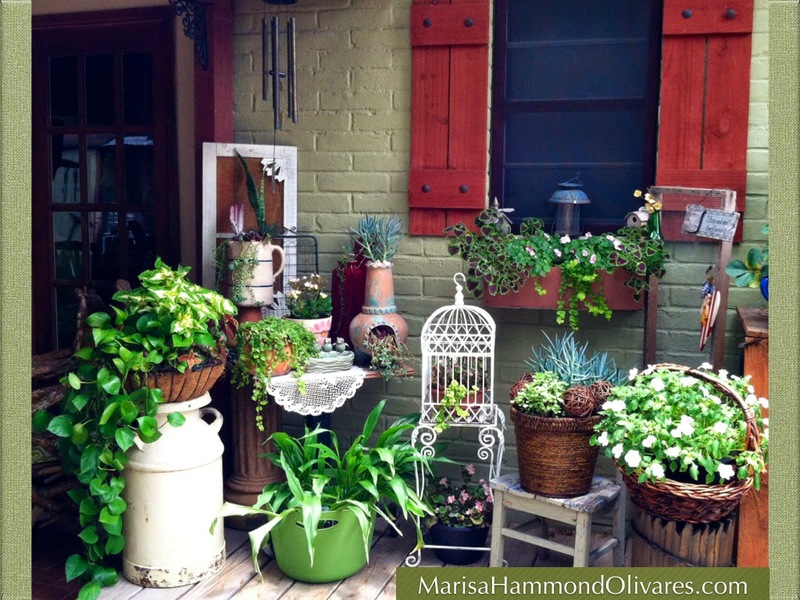 A perfect focal point for an entry or courtyard. 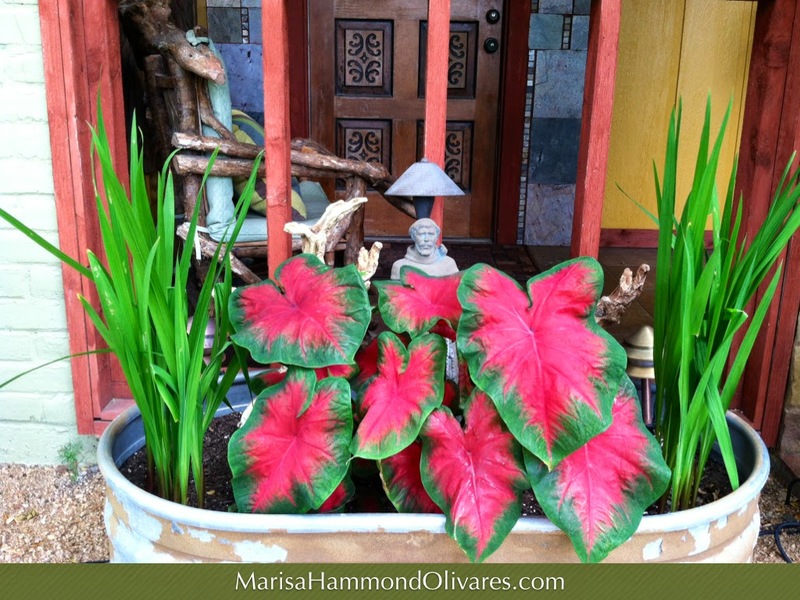 St. Francis peeks over red caladium in a galvanized tub with acidanthara. 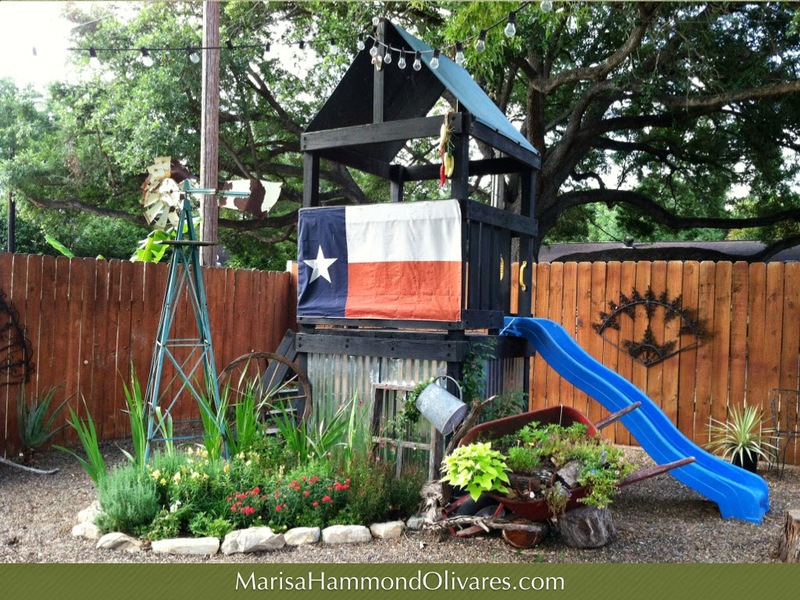 A rusty windmill, tilted wheelbarrow and flag help complete this Texas garden. 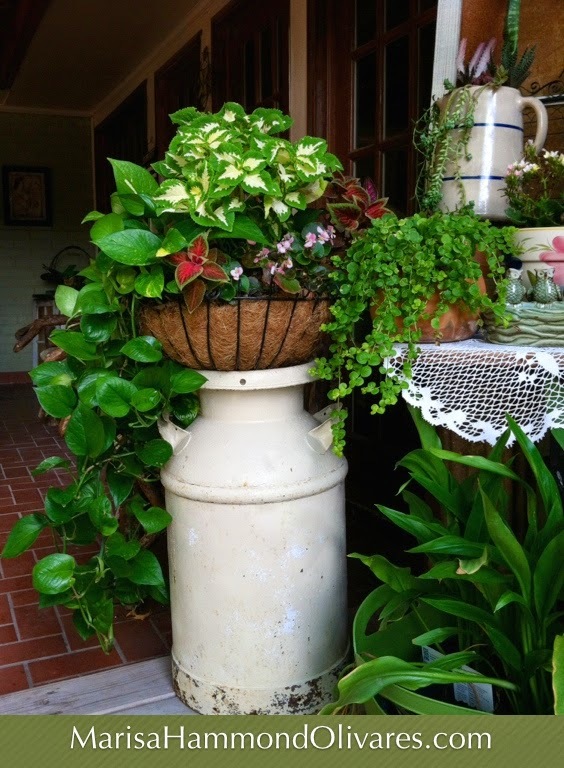 A vintage milk container is the perfect stoop for a basket of pythos, coleus and impatients. What a beautiful retreat you have to escape too!